As a new decade chimes in, the unstoppable leviathan that is social networking continues to provide a vehicle for the millions of people who feel it necessary to inform us all of what they’re up to. Whether it be on Facebook, Twitter or YouTube, an incomprehensible number of people are more than happy to provide an intimate (and nearly always hugely dull) account of their daily lives. This always makes me smile, bearing in mind the aforementioned sites’ roots as domains for the terminally geeky. While I use both Facebook and Twitter regularly, I’m of the opinion that people don’t really give two hoots what I’m having for dinner or where I’m going at the weekend. I struggle to care myself, sometimes. It was therefore with some delight that I discovered Momento, developed by d3i. This beautifully designed App allows you to create what it refers to as ‘moments’. Daily thoughts, an account of what you’ve been up to… whatever you like, basically. Where it gets clever is with the way in which Moments are organised. They can be categorised via tags, places, people, events and even a star rating for you to hunt out and reminisce on those good days past. Key to Momento’s inevitable popularity and the reason it takes pride of place on the first screen of my iPhone is its ability to make diary writing addictive. The simple process of being able to tag entries with the information described above makes it a joy to use and something that you’ll keep coming back to. Integration with Facebook, Twitter, Flickr and Last.fm helps ensure that you have a complete, searchable record of your digital account of life. I’ve never kept a diary, but being fond of writing and somewhat cautious over the publication of my private life on social media networks, Momento has got me right into it. I can jot down whatever I like without the fear of boring people and the handy password entry means no one can read my incompressible ramblings and thoughts. Furthermore, photos taken are stored against their respective dates, undoubtedly making this App a very handy tool for Photographers. 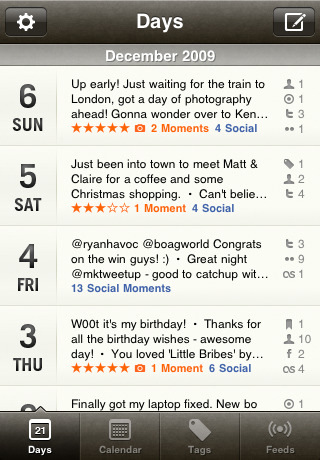 So, here’s one of the few iPhone Apps that has a genuine longevity factor – Momento. In fact, it’ll probably hold that crown for life, as I suspect it is something that will accompany people for the majority of theirs. 10/10. Go check it out. Well said. I really love this new app. Have had it about 4 days and am making lots of entries. Like the backfilling and on-going entry of my tweets. Love the photos and the best tagging ever. The speed of entering people and tags and the speed and method of searching your notes makes me want to retire simplenote – no tagging. I was using a Moleskine for several years, so am into journaling but I wanted it digital and wanted it compelling. Momento is a great start for that.